Shaky start but we’re back with a win! 2018 has been a difficult year so far for the world of drag racing in the UK. We’ve lost a race track due to the owner selling the land for a housing development and the new surface at Santa Pod has been tricky to say the least. We are so pleased to announce that Scott Hauser has won both the 2017 Santa Pod Racers Club and National Super Pro Championships in a dramatic final round finish at Santa Pod last weekend. 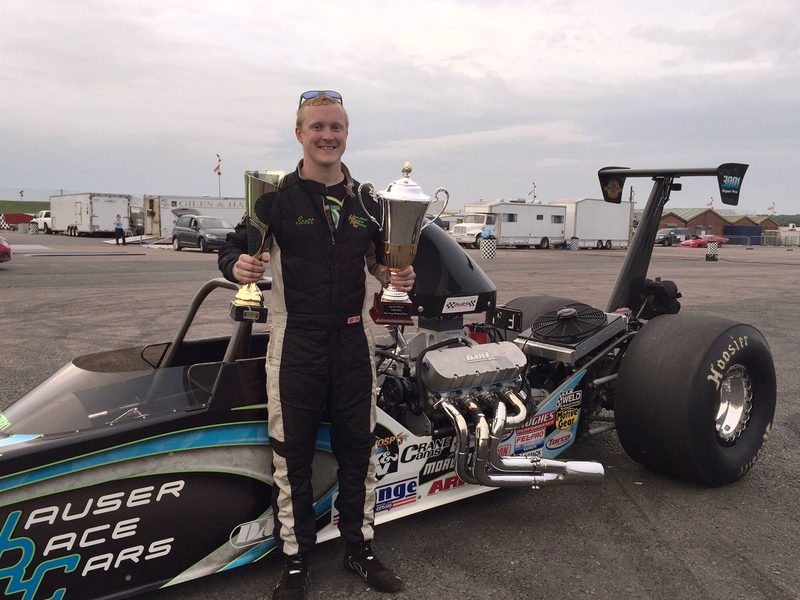 Hauser Racing—Another Santa Pod Championship! Well, another season is over and I’m pleased to say Scott is the 2016 Santa Pod Super Pro Champion. Nothing was easy though, another tough year in the most competitive class, sometimes with over 40 cars entered for the 32 car fields. In fact, going into the National Finals last weekend, we were more than 2 rounds behind the leader, but we managed to turn it around. The 2014 season got underway over the Easter weekend at Santa Pod and was supported by a healthy 27 cars. Despite the 6 month winter lay off, Scott continued where he left off last year and took 3rd spot with a 0.007 off his 7.52 dial in. The weather was always threatening, which at times gave some impressive DA figures of -300 feet and performances were good for everyone. During eliminations Scott won the 1st round but got caught napping on the start line in round 2 and despite a close-to-index run, got beaten. Luckily for us, the rain came and more racing took place so no-one else got a points lead advantage. Our 2nd race of the Championship was in Stratford upon Avon at Shakespeare County Raceway, and we had sunny weather all weekend. Again we qualified 3rd, this time with a 0.005 off. Only a 16 car field at this event but we won every round and won the event! Both the cars’ and Scott’s performance were unbeatable all weekend and over a total of 10 runs, the performance didn’t vary by more than 0.06 seconds despite differing weather and track conditions. We are now leading the Nation Championship and looking forward to the International Main Event at Santa Pod in a couple of weeks. Already there are 47 entries, so it’s going to be tough, but we have a good car and driver and hopefully we will come out on top again. On a separate note, we held an open evening at our premises during the Easter event to promote our new dragsters we are building. Check out www.eurodragster.com/news/features/hauser_racing_open_evening/ to read the feature. We’re 2 races into the 2013 season and so far, it’s going brilliantly with runner-up and a win under our belts! Our first outing was over the Easter weekend at Santa Pod when the temperatures never rose above 38 degrees and combined with a freezing Northerly wind it made the whole event an endurance battle. The outlook before the event wasn’t looking promising. Santa Pod had just been resurfaced, but awful weather for the following 4 weeks hampered any attempts to prep it to any decent standard, so we were not really looking forward to running on such a slick, untried track. However, the track crew really managed to turn it around and our performances did not suffer – in fact we ran a new personal best of 7.61s @ 174 mph. The freaky weather conditions gave us a Density Altitude of -900 ft which made up for the freezing conditions, although it was a constant battle keeping the motor warm. We qualified 2nd in our 32 car field and worked our way to the final where our opponent ran a perfect 0.000 reaction time. Hard to beat that one, but a good start to the season anyway. Our 2nd event was at Shakespeare County Raceway in Stratford upon Avon over the first weekend in May. Here there were only 16 cars in our class but at least we had better weather throughout the race. We again qualified in 2nd place and again made it to the final but this time we won! The car worked great and ran consistently on the dial in all through eliminations. These results put us firmly in the lead in the National points championship. Our next race is the International Main Event at Santa Pod in a couple of weeks. There are already 46 cars entered in our class so it’s going to be another long battle, but we will be prepared. Hauser Racing wins 2012 Santa Pod Super Pro Championship! After a season plagued with bad weather and several total rainouts, we are proud to say we eventually came out on top. It was a year of frustration with half of the season affected by the weather, which also prevented a lot of testing, but in the end we pulled through. We had a run of impressive qualifying positions, number one twice (including a bang-on to 0.0000) a 2nd, a 3rd and always in the top 10 throughout the year. These positions combined with a couple of final round appearances got us the trophy. Our new motor, which we debuted in June, is a 598” BBC on unleaded pump gas and ran flawlessly giving us a best of 7.64s at 173mph, with a best sixty of 1.06s. Although Scott is only in his first full year with the car, he is a feared opponent and his previous experience in Junior Dragster has certainly given him an edge. Finally, finally, we have managed to complete a race meeting here in England. The first 3 races of the season have not got past the first round due to constant rainouts, and even though we are in the middle of summer the weather here has been appalling all year. The long awaited new motor got finished in May and with tire and gearing changes was ready for the test day preceding the Santa Pod Summernationals. Well, it rained again in the morning and it wasn’t until 3pm that they got the track open. We managed a couple of light passes before more rain ended the day so we had to go into qualifying with an untried combination. Our apprehension was short lived though as we qualified #1 with a 7.903 on a 7.90 dial in! Our position held up throughout the sessions and we took the #1 bonus points. Race day, we got through rounds and into the final, but a 0.005 red light spoilt the day. Despite that small hiccup we are now leading both the Santa Pod and National Championships and looking forward to some more testing and the next rounds. After seemingly an eternity of delays, not enough spare time and last minute hang ups we finally debuted the new Hauser Racing dragster in mid August. Although the car took longer than expected to complete, the wait was definitely worth it. The car was set up in the workshop and then went arrow straight on its first run and drove like a Cadillac. This is the first dragster we have built with suspension and the ride is great. It’s interesting to see how much the shocks actually travel during a run and I’m sure they help greatly in keeping the car on the straight and narrow. Our first proper race event was the Euro Finals at Santa Pod. We qualified 16th out of 48 cars and went a couple of rounds before an 0.002 red light ended our day. We are currently using a fairly mild 509 Chevy motor and our best is 8.06 @ 164mph. A step up to something bigger is planned for the winter, nothing too wild, probably something to run mid-sevens should still be consistent. In the UK we race in a bracket that spans from 6.00 to 8.99 and delay boxes and throttle stops are banned so we don’t want to make it too difficult for ourselves.